DESOLDERING TOOL The Hakko 808 is a handy, portable desoldering tool with a built-in vacuum pump. No separate station is required. Thin, comfortable grip and low vibration. 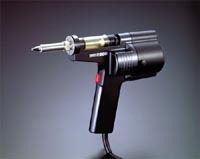 This unique Hakko design places the pump and motor above, not inside, the grip. Vibration is kept to a minimum, and the grip is thin and easy to hold. Delicate tasks are performed with greater ease; the tool can be used for long periods without operator fatigue. Simple and inexpensive pump maintenance. The new, miniature, high-performance diaphragm pump is housed in the chamber at the rear of the Hakko 808. Pump maintenance is quick and easy-simply remove the cover. If repairs are ever needed, replacement parts are inexpensive. Tip-to-ground potential difference no greater than 2mV. Tip-to-ground resistance no greater than 2 ohms. Adjustable temperature control (380°C - 480°C / 715°F - 895°F) Includes Carrying Case and Hot Sock. Part Number, Gun: 808-5. 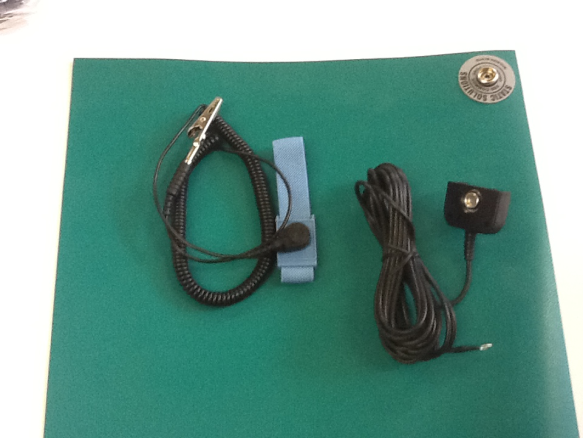 Part Number, Carrying Case: C1099. Part Number, Hot Sock: 605M.